Hyaluronic Cream – Natural Hyaluronic Acid Body Cream Hyaluronic Acid (HA) is a naturally occurring compound found in every tissue of the body with the highest concentrations found in the skin and synovial fluid in the joints. Hyaluronic acid and collagen are responsible for the moisture, suppleness and elasticity of skin. Hyaluronic acid also functions as a lubricant between the connective tissues. A topical Hyaluronic acid cream may reduce the appearance of wrinkles by supporting the body’s own skin production cycle. As we age, an HA supplement can help increase our overall skin and joint health. 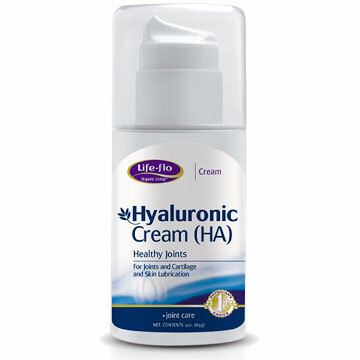 Life-Flo’s Hyaluronic cream is also excellent at relieving dry skin. Hyaluronic Acid Cream Features: Excellent anti-aging skin moisturizer Helps support the body’s natural skin reproduction cycle Absorbs extremely well Airtight clinical hygienic container protects the ingredients from oxidation, insuring potency Key Ingredients: Sodium Hyaluronic Acid Gel, Shea Butter, Glucosamine, MSM (Methylsulfonylmethane), Vitamin E, Aloe Vera Gel, Sunflower Oil, and Dipalmitoyl Hydroxyproline. This entry was posted on Saturday, July 7th, 2007 at 12:01 am and is filed under Skin Care. You can follow any responses to this entry through the RSS 2.0 feed. You can leave a response, or trackback from your own site.